Yoga is generally safe and healthy. No exercise is perfect, and yoga is no exception. Although this meditative exercise battles stress, promotes calmness and improves strength, flexibility and balance, it isn't a good fit for everyone. That said, there's no reason to give up on yoga if you adore your Bikram class. Typically, yoga's disadvantages are easily avoided with a bit of proper planning. If you're new to yoga, see your doctor before diving in. Yoga is the whole package. 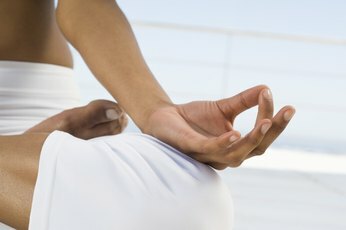 Incorporating physical poses with meditation and breathing techniques, this ancient Indian practice exercises the body and the mind. Vigorous styles such as Ashtanga and Bikram are effective for building muscle and burning calories, while gentler styles such as Integral and Kundalini focus on meditation. Most sessions last 45 to 90 minutes, and you may need to practice at home to perfect the poses. Don't run from yoga in fear of injury -- it's usually safe for healthy women. However, serious injuries such as strokes and nerve damage occur on rare occasions, according to the National Center for Complementary and Alternative Medicine. Certain poses are especially risky if you have glaucoma or high blood pressure. Even if you're healthy, you could suffer muscle tears if you attempt difficult poses too quickly; injuring hamstrings, shoulders and wrists may lead to long-lasting pain. Help prevent injury by using proper form and mastering easier poses before moving on to more complex moves. When you go to the gym, you probably don't need a personal trainer to help you figure out the treadmill or leg press. Yoga, however, is a different story. Even if you purchase a DVD or watch instructional videos online, it may be difficult to learn to perform poses correctly; thus, a yoga class is often the best bet for beginners. If exercise classes are your cup of tea, this may not be much of a disadvantage. But if you're a do-it-your-self gal, the need for training could be a repellant. Plus, yoga classes can be pricey, making this a less economical workout option. 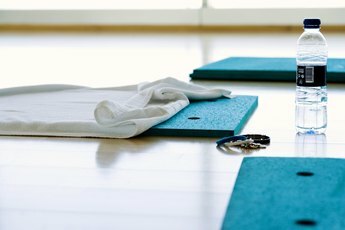 Hot yoga such as Bikram is all the rage, but it comes with its own set of disadvantages. Studios are often set to 105 degrees F and 40 percent humidity, which can be downright uncomfortable for some. With the high temperature also comes an increased risk of dehydration and heat stroke, making this style unsuitable for those with cardiovascular disease, hydration issues or a history of heat-related illness. If you opt for hot yoga, bring plenty of cold water, and head out the door for a break if you feel dizzy.